Ever wonder why something is trending? Let’s explore what made the global Twittersphere turn, in our International Twitter Trends of the Week, Volume 32. Many of us grew up in the generation that spent every school night chatting with friends on ICQ and MSN. We perfected our speed typing and multitasking skills while managing several conversations at once. Lol, brb, jk, omg and emoticons :) made up a good portion of the chats. But, as with all trends (especially in technology) we move on to the new and improved. 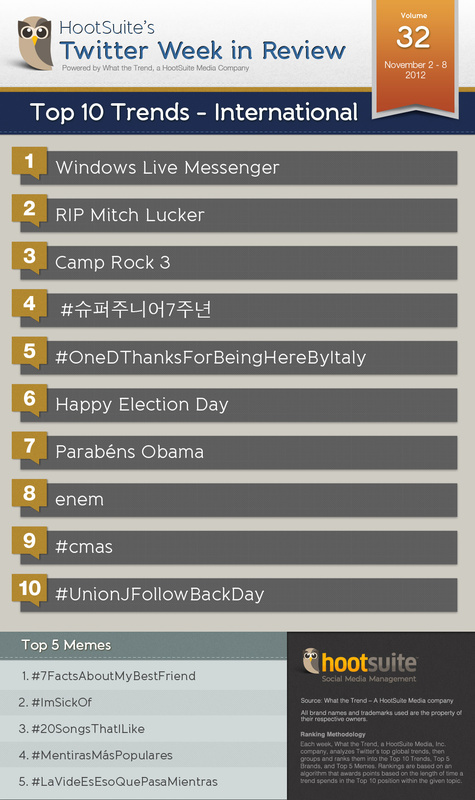 Number one on our Twitter chart is Microsoft’s Windows Live Messenger, previously known to our generation as MSN. But why trend now? Windows Live Messenger is trending because the CEO of Skype announced last week that the millions of WLM users will be integrated into Skype chat over the next few months. An internet analysis report suggested a 48% drop in year-on-year unique users to WLM, while Skype, the popular service that Microsoft acquired, continued to grow over the same period. Because of this, Microsoft plans to retire the messenger service globally except for in China; moving all users to Skype within the first quarter of 2013. Once again, Twitter serves as a place for people to connect over the lost of loved one. RIP Mitch Lucker is trending after the vocalist from American heavy metal band ‘Suicide Silence’ passed away from a tragic motorcycle accident November 1st. 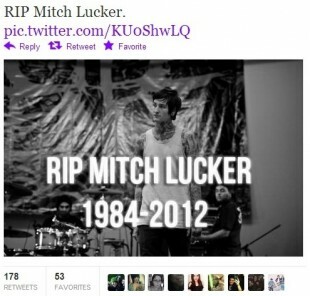 Mitch Lucker fans are reeling from the shock of the news. Flooding social media channels, thousands expressed their sadness and offered condolences to his family and bandmates. Another emotional trend was Happy Election Day, after Americans took to the polls to vote in the US Presidential elections. After a tense evening of watching Ohio and Florida results, Barack Obama was reelected to a second term. Since then, Parabéns Obama is trending in Portuguese to congratulate Barack Obama on his reelection as president of the United States. Stay tuned for next week’s Trends of the Week to freshen up on Twitter’s popular culture. First timer? Check out last week’s What the Trend and start trending.